Most koi kichi that live in areas with cold winters will have a tried-and-tested routine for dealing with their koi and bad weather. More often than not, born out of experience (both good and bad), their methods of preparing for winters are entrenched and they usually work. And then sometimes they don’t. 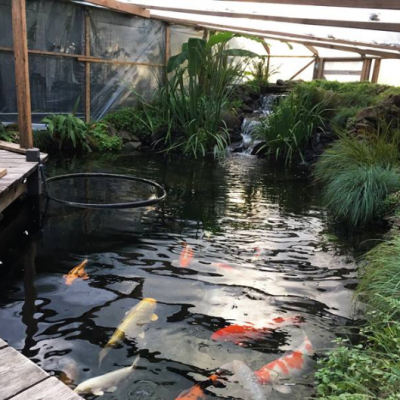 As long as your pond is deep enough and has a means for gaseous exchange, your koi have the means at their disposal to survive a fairly harsh winter. However, not all winters are created equal. One winter may not be the same as the last. And there are those times when there are extremes. There is always the capacity for some extreme temperature fluctuations that add a new level of concern for many koi keepers who may not have had to contemplate the severe drop in temperature in the past or simply haven’t had temperatures dip that low in their area. And then there are changes in the pond’s condition that can also impact the winter’s effects. Things like higher fish loads, bigger fish, inadequate or incomplete cold weather preparation. Some old hands will tell you that despite their best efforts at winter-proofing, sometimes they can do nothing more than offer prayers to a higher power when things get really cold. But that doesn’t mean they don’t prepare. I live in a climate with 5 months of winter. And an average of 300” of snow. We built our pond with a pavilion over it. For winter we surround it with greenhouse sheathing (heavy reinforced plastic rolls). We run 2 Airmax ps1 aerators (in case one fails). Our filtration is housed in a building that is heated with a wood boiler and each IBC tote in the system has an inline heater to prevent freezing. (We had to do this because the Baki showers are last in the system and we need to keep them from freezing/ice buildup.) 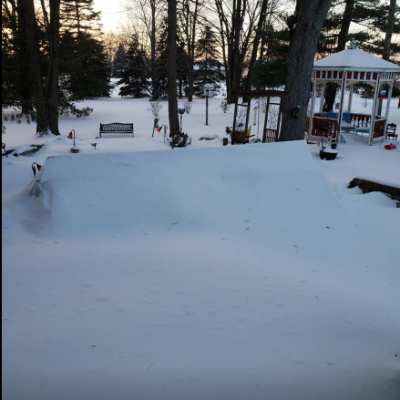 We have more than 6’ of snow surrounding the pavilion sides now and no ice even though our actual temps (not windchill) have dipped as low as -15F. Koi are extremely hardy fish and are capable of withstanding some pretty extreme conditions and temperatures. During the colder months, they go into a torpor, which is like their own type of aquatic hibernation. But there are some ways to help them be more comfortable during their wintering. It is also important to remember that preparing for winter is not just to protect your koi from freezing to death in extreme conditions. It is to limit the amount of stress to the koi, too. That stress in your pond can make your koi more susceptible to illness and disease as their immune response is compromised. The conditions may be rough but Dan Olson makes it look beautiful with this shot of his awesome winter coverage. The deeper the pond, the less likely it is to freeze to a dangerous level and impact the koi underneath that cold water. Deeper and narrower is better than wider and shallower so that the different temperature zones can form with the warmer being at the bottom and coldest at the top. A deeper pond also allows for better uniformity in the pond’s temperature. Water is better able to keep heat than air. Also, the bigger the water’s volume, the more heat it will store. 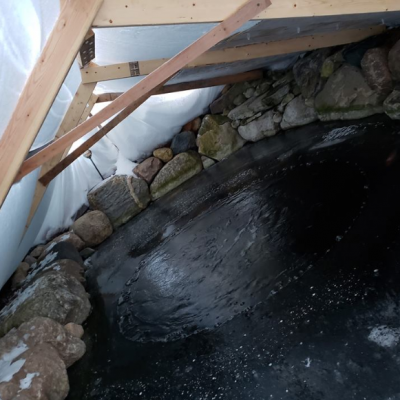 For northern ponds, they must be built deep enough that it goes at least 2′ below the freeze line so the koi have a place where the water won’t freeze. As exciting as avant-garde shaped pods can appear, they can be hard to oxygenate adequately and lead to “dead zones” with low dissolved oxygen. It is bad news at the best of times, but even more so in winter. Simpler pond designs in areas that experience moderate to severe cold months, although less visually appealing, are better for the unsuspecting, slow-moving koi that might swim into this low-oxygen area and not recognize the danger until it is too late. Ice can provide a layer of insulation against the wind. In colder areas, it is wind that is most detrimental to water temperatures and will quickly leech the heat from the water. It is when a pond completely freezes over, or an opening isn’t maintained for gas exchange, that ice becomes an issue on a koi pond. DO NOT bang on the ice to open a hole for gas exchange. This concussive force can be lethal to your koi underneath. Rather, melt it with hot water. Similarly, if you chose to remove the snow from the ice (there are positives and negatives to this) don’t scrape it off. A koi might slow down, but it doesn’t stop moving. Or breathing. So it will need air, no matter what the temperature of the water. An aerator will help with both. Pulling the aerator 8-12 inches from the surface will allow an undisturbed place for your fish to lay and if your water temp is 39 the water will stratify and the warm water will go to the bottom of the pond if it’s not being circulated chilling. It will oxygenate the pond and by moving the water, making it less likely to freeze in the area above the aerator. This will then keep a hole in the ice for necessary gas exchange allowing for the removal of any potentially fatal gases that can get trapped under the ice as the natural processes in the water under it continue. In general, an aerator will be less expensive than a deicer. Aeration should also be moved off the bottom of your pond. If an aerator is placed at the bottom, it will cycle the warmer water from the bottom causing cooler water to move in, which can be potentially fatal for your koi. The water then becomes supercooled. Scott Nellet set this up to fend off temperatures that dropped to -40F. This is outside. These can be instrumental in maintaining an opening in a frozen koi pond’s surface. They will not heat the entire pond, but they will heat a small area and prevent the water from freezing. If you have a cooler put it over the heater and open the drain. That could help melt a hole. Blocking the wind can be the most effective way to preserve heat even if it’s not a well-insulated cover. 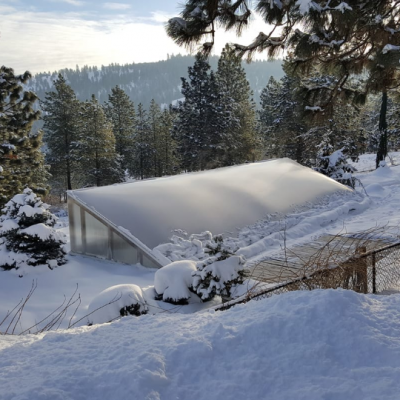 Some koi keepers in colder climates will use a pergola as a means to add features to their pond for the summer and then use it as a framework for a winter coverage, adding plastic sheets to keep out the worst of the elements. Keeping your koi comfortable through the cold months can be a labor of true love. Karen McDivitt Carnathan puts this framework over her pond for winter and then takes it down in April. Cold weather wreaks havoc in more than a pond. It often causes issues with the power that is necessary to keep key features (like the aerator) up and running. It may not be necessary, but as in all things koi, it is always helpful to have backups. Gas-powered generators or a UPS (Uninterrupted Power Supply) can be life-saving for your koi if your electricity goes down. Run aerators on different circuits. And it may be something other than a simple power outage. The equipment itself might succumb to conditions. Condensation in an airline can lead to a blocked hose to the aerator when the moisture freezes. Housing the apparatus in an insulated shed or out of the elements can help to limit the potential for this occurring. Complacency is a killer. This can be deadly as any power outage or hyper-cooled pond. Your pond prep is only as good as last year’s conditions. Thinking to yourself “this will be good enough” is a dangerous mantra. Salt may be a great deicer, but it also can make water temperatures plummet. Salt lowers the temperature at which water freezes. Therefore, salt in the water can be lethal to the fish, preventing that ice layer from forming at normal freezing temperatures. When in doubt (or a flat panic), or if you have concerns or questions about an expected dose of cold weather, reach out. There are numerous resources available online and many caring koi keepers who are willing to share their best practices when it comes to koi and winter extremes. Thanks to the group All Things Koi for their contribution to this post. Thank you for this article. I have had koi for about 18 years and never read or heard anything about salt in the pond affecting the temp at which the water freezes and thus endangering the koi! Makes perfect sense now that I think about it though. We bring as many (if not all) of our koi into our basement for the winter but there have been times when we had to leave some outside. We made our own “de-icer” for gas exchange and most years it worked great. I wont go into that as I mostly just wanted to say thank you for this article!